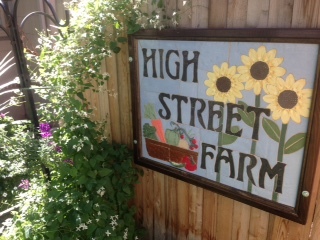 High St. Farm (HSF) was created in 2012. The inspiration behind HSF was to take an 1/8 acre plot of urban land and turn into a place where we could reconnect with our food. This 1/8 of an acre turned into a mecca in the city that hosted groups of students from grade school through university troops of boy and girl scouts; and many others who wanted to learn how to grow food sustainably in the city. We also hosted community events at the farm: Open Houses, Yoga at the Farm, food justice events, and events created around HSF’s seasonal harvest. Even with all of this we were still able to grow food for Sazza. 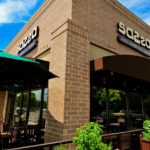 Our customers could enjoy the HSF seasonal harvest in small batch soups and on our dessert pizza. Sadly during the Spring of 2015 we needed to close our beloved HSF. Even though we were heartbroken to have to close this special space there is a silver lining. During the Summer of 2015 Sazza was given a 1/2 acre plot a stone’s throw away from our soon to be second restaurant location at Stanley Marketplace. Yes, Mark Shaker the visionary behind this new marketplace and the rest of the crew at Flightline Ventures gave us a 1/2 acre to start over. What an amazing and generous gift. Sazza’s Urban Farm aka High St. Farm will be bigger, better and continue to be a platform for Sazza to spread the word on sustainable growing and food justice. All the while providing a place to bring our community together around food. Our goal is to plant during the Spring of 2018. With more space than our original farm we will be able to grow more goodies for our Sazza customers to enjoy in seasonally inspired dishes. In the meantime we will be getting the soil ready, setting up our beehive, building a chicken coop, building an outdoor wood-fired pizza oven and seeing about a windmill to make the farm completely wind powered.